I don’t know how women survived back in the days before internet, bookstores, apps and Youtube! Okay, in some ways I wish life were still that simple, but I am also so grateful for the resources that are right at my fingertips. I am a “pick and choose” mom. I don’t commit to any one resource as my “silver bullet” but I love to seek advice and wisdom from many places in raising Nora. Since I have so many friends who are moms, I wanted to share the resources I love and use on my journey as a mom! I really don’t use apps too often for motherhood purposes anymore, but there are two I used when Nora was a newborn that I really liked. 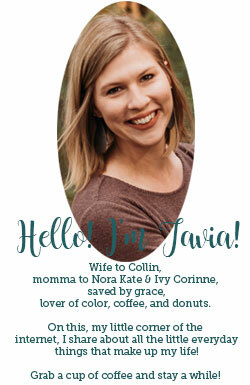 Ovia – I used this “app family” while trying to conceive (it tracks ovulation), during pregnancy (shows baby’s growth in womb) and after Nora was born (updates on development should see). Very helpful and full of great tips. Moms on Call – Now, Moms on Call is like a way of life for some mothers. They have a website, a book and an app. I only used the app from when Nora was 1-3 months for scheduling tips. It gives you suggested wake, eat, sleep schedules that you can put your baby on. I didn’t follow it exactly but it was helpful to see examples and it really helped in Nora’s early life. I actually love to read but I am not a fan of non-fiction or self-help books. I want to read a story and escape to another world for a while. So, this list is short where it could be really long. There are so many great motherhood books out there. It’s just not really my cup of tea. The Bible – As “cliche” as this answer might sound, it really is the ultimate resource for motherhood! I find that now as I read scripture I find things all over that apply to being a mom. Even if they aren’t explicitly referencing motherhood. It is also so important to have a strong and grounded faith yourself as a woman. This will help your journey as a mom immensely. I think more moms need to make this their number one resource in raising little ones. Then we might see a change in our world. Magnolia Story – Who doesn’t love Chip and Joanna Gaines? Their book is so good and a really quick read. This might sound silly, but for some reason when I read their book I was inspired in ways I will parent in the future. The book is mainly about Chip and Jo’s life and how their Magnolia “empire” came to be, but many tidbits of Gospel truth and parenting talk are thrown in. I love how Chip and Jo put God and family above all else. They are intentional about family time and giving their children an amazing childhood. To them, that doesn’t mean lavish vacations and everything their heart desires. It means experiences, life lessons and relationships. Read the book for yourself and see if it doesn’t spark a desire in your heart to do the same. Gosh the resources online are unlimited. I am choosing just one that I really love, but I am going to give you some specifics! Instagram – Instagram is my absolute favorite form of social media. I love how it can be used for so much good! There are a few moms I follow who are always inspiring me or have encouraging things to say about motherhood. Comparison can sometimes creep in when I see these women, but mostly I am just inspired and encouraged. We can all stand to want to better ourselves as long as we keep the green-eyed monster in check! These are a mix of regular old moms who blog and women who maybe have a ministry or business. But, if you want some encouraging moms to follow, here ya go! Mom Struggling Well – Hilarious, real-life momma! She also has a great podcast. Nicole V. Cole – Her blog is one of the first I ever read and he story of how she became a mom is amazing. This amazing mom is raising two itty-bitty babies (a one month old and a 4 month old). She is always so full of God’s truth and love! Shan Tripp – This woman is my momma spirit animal. She LOVES being a mom and her joy in motherhood is contagious. I originally found her on Instagram but she just launched a motherhood website as well! Brittany Price – Another mom with an amazing story and a heart for God. Her utter trust and reliance on God is inspiring. Alyssa Joy Bethke – You might know her husband from his Youtube channel but his wife is just as cool! Alyssa is one of the most joyful and positive moms I have ever seen and I think we can all use a little more of that! Plus, her family lives in Maui and their scenery is gorgeous! I hope this little list maybe gives you some good tools and inspiration in your motherhood journey. If you have any questions about these or want more like them, let me know! These are great resources! Thanks so much for sharing them!